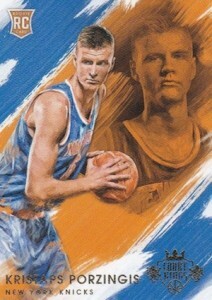 Rapidly becoming a household name, Kristaps Porzingis has shown flashes of brilliance and periods of dominance during his NBA career. 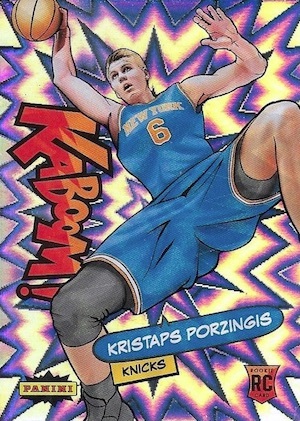 This, in turn, has Kristaps Porzingis rookie cards climbing up the ladder with NBA collectors. 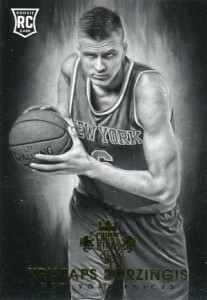 Able to play both the four and the five, the 7'3" Porzingis started his professional career in 2012 with Baloncesto Sevilla (Spain) before being selected fourth overall by the Knicks in the 2015 NBA Draft. Although it is still early on, the young player has the Big Apple buzzing! 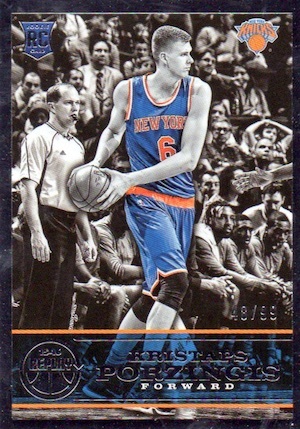 Shop for Kristaps Porzingis cards on eBay. After a great rookie year that finished with an All-Rookie First Team selection, Porzingis appeared to transition to the next level during the 2017-18 season. 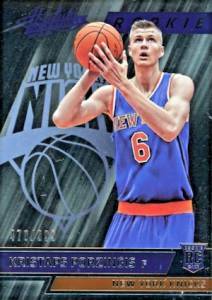 The following guide showcases the many Kristaps Porzingis rookie cards found in 2015-16 basketball products. 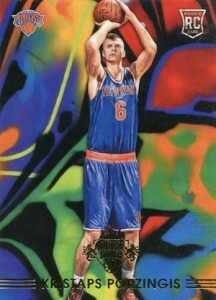 If you are interested in top cards from throughout his career, see his most popular auction listings on eBay. 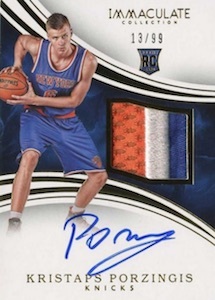 Those looking for signed memorabilia should be aware that Porzingis' autographed gear is exclusive to Steiner. Click on the images or listings to shop for cards on eBay. Bolded sets go directly to product profiles with checklists. 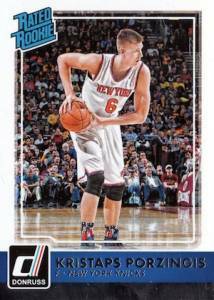 A low-end option in a popular set, 2015-16 Donruss includes the Rated Rookie card for Porzingis. 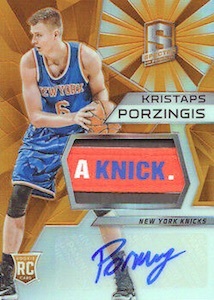 KP also has several signed cards, but the low-numbered autographs in the Elite Dominator insert are among his most pursued, including the Gold version numbered to just 10 copies. 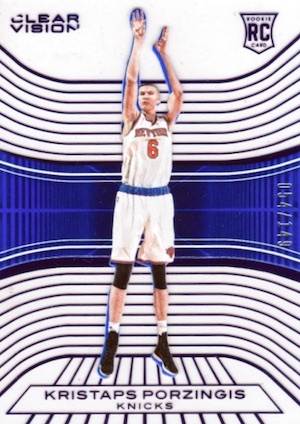 Another brand with an established hobby history, the Kristaps Porzingis rookie card in 2015-16 Absolute is done in foil and limited to 999 copies. It's also the place to find the high-dollar Next Day autographs that feature an on-card signature, plus his Tools of the Trade autographs. 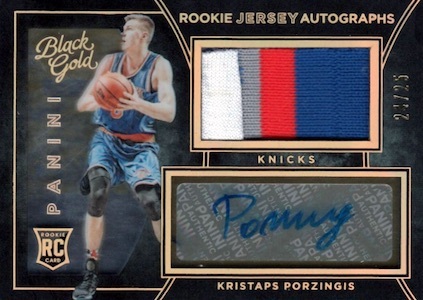 Issued in the NBA debut set, 2015-16 Black Gold is a more premium choice for Kristaps Porzingis rookie collectors. The Rookie Jersey Autographs insert, limited to 199, has Prime (#/25) and Tag (1/1) parallels, while Sizeable Signatures is numbered to 99, also adding a Prime version. 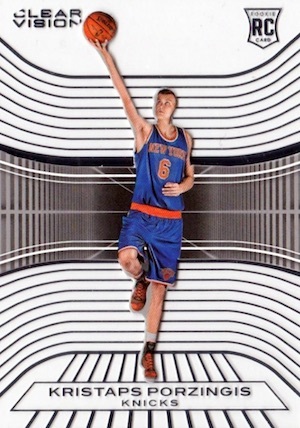 A little something for the acetate fans, Porzingis has a home and away jersey image for his main 2015-16 Clear Vision rookie. 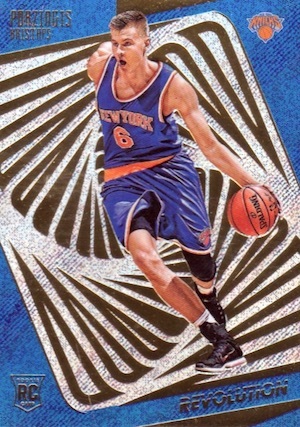 The base rookie shows his blue Knicks jersey, and the variation goes with white. 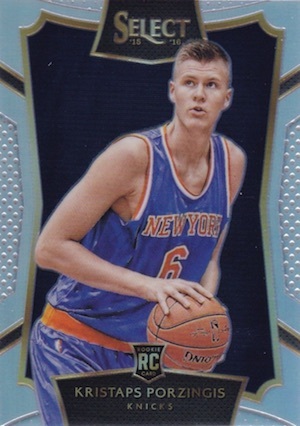 Intended to be on the lower side of low-end collecting, there is little to the rookie card for Porzingis in 2015 Complete. While it does not offer much in terms of value, the bare-bones design is a solid option for TTM autograph requests. 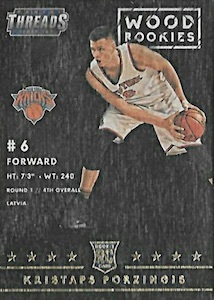 Part of the college-themed 2015 Contenders Draft Picks product from Panini, Kristaps Porzingis is in the International Ticket portion of the main set. Offering a sticker autograph, there are multiple parallel tiers with increased rarity. 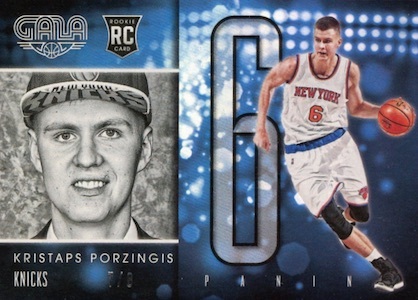 Featuring plenty of variety, 2015-16 Court Kings presents collectors with six different Porzingis rookie card designs in the base set. Rarity increases as the card number does, and the final four cards are numbered from 299 down to just 10 copies. Joining the simple base card with a large background design, 2015-16 Excalibur also has several levels of the Crusade inserts, case-hit Kaboom! 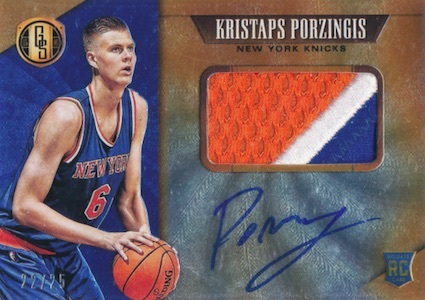 cards, and a few sticker autographs for Porzingis. 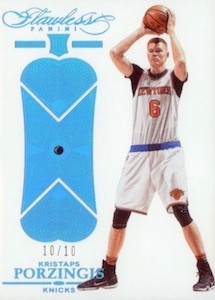 Reserved for those with ample resources, 2015-16 Flawless uses gems in the base cards that are limited to 20 copies or less. 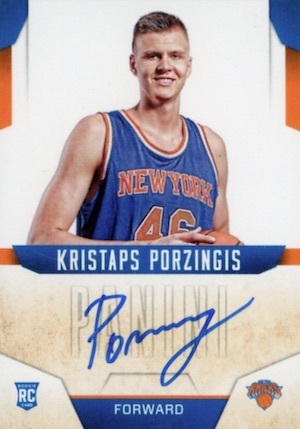 Porzingis also has a few hard-signed cards that are quite popular and valuable. 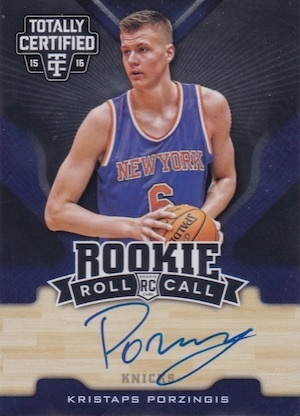 Rarity above all else, the Porzingis rookie in 2015-16 Gala has just eight total cards and no parallels. 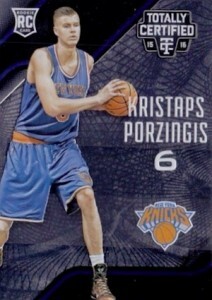 By comparison, his hard-signed cards in the product seem downright excessive with as many as 60 copies. 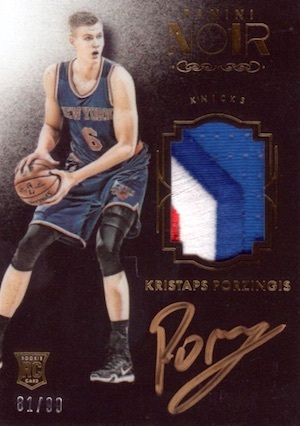 With four different auto relics in the main 2015-16 Gold Standard set, Kristaps Porzingis rookie card collectors have a tough challenge to assemble the group. Although they are all very similar, each has a different image and memorabilia layout. On top of that, all four rookie subsets come with low-numbered Prime and Tag versions, including the jumbo patch card below. 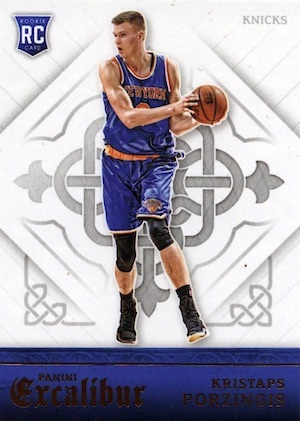 Among the best of Porzingis' rookies, 2015-16 Immaculate delivers the goods with an attractive design and print run of just 99. 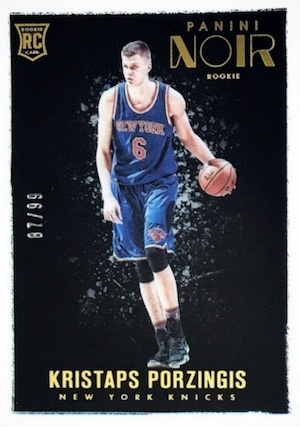 With only 80 copies, the 2015-16 Limited rookie card for Kristaps is in fact, well, limited. At least for a base card. Also intriguing is the Rookie Jersey Autograph, numbered to 99, and the dual signature with Dirk Nowitzki. 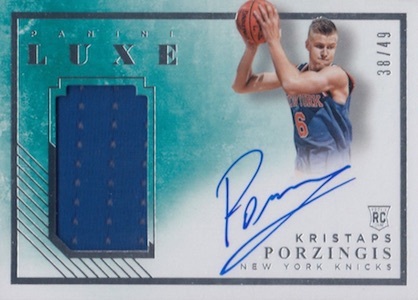 The hit-only 2015-16 Luxe has no base cards but Porzingis is found in several of the signed sets. All are autographed on-card and carry limited print runs, so it's really about picking from the design styles. The main autograph line and the D-Luxe set offer metal frames, while Jumbo Jerseys Autographs and the standard RPA both pair relics with signatures. 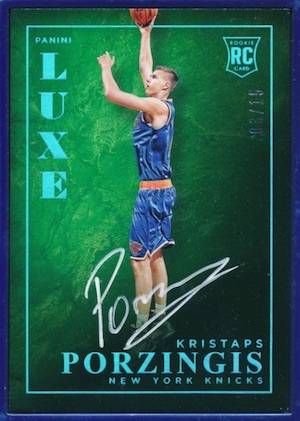 Matching Immaculate in most aspects, the Kristaps Porzingis rookie card hierarchy mainly boils down to specific collecting tastes and how much value you assign to the National Treasures brand. The main difference is the horizontal layout and much bigger patch. 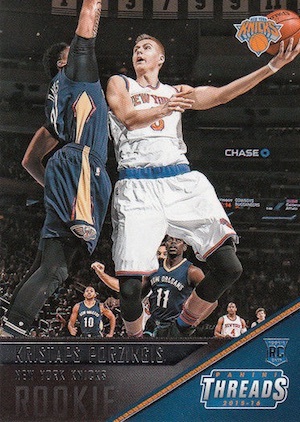 This 2015-16 NT card commands a premium and is easily one of his most impressive. 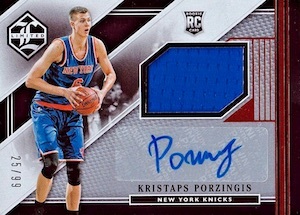 Simple and inexpensive, 2015-16 Hoops is a top budget choice and the very first Kristaps Porzingis NBA card available. 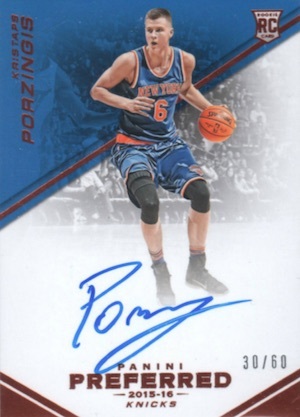 Collectors have gravitated to the other first in Hoops for Porzingis: his Hot Signatures autograph. Striking and unique, the contrasting nature of 2015-16 Noir means twice the amount of choices. 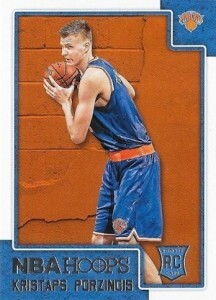 Porzingis has a base rookie in color or black and white, and both are numbered to 99. The same is true for the RPA, also found in two forms, and again with a print run of 99 copies each. 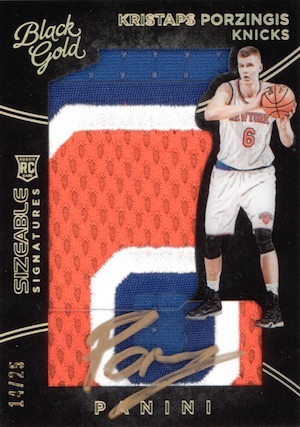 Another product with only autographs or relics, Porzingis has four signed cards in the base 2015-16 Preferred set. 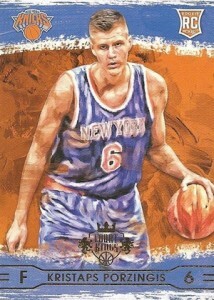 Most popular is the Silhouettes autographed jersey card. 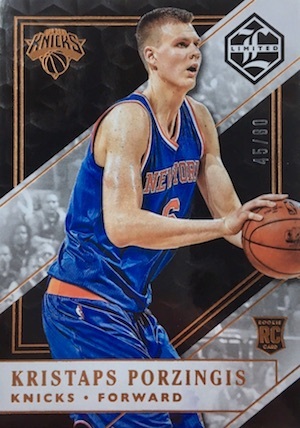 A basic rookie choice for Porzingis, 2015-16 Prestige is only found at Target. 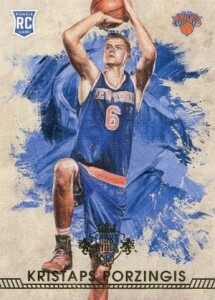 The real draw is the on-card autograph Prestigious Premieres Signatures insert with a moderate print run of 299 copies. 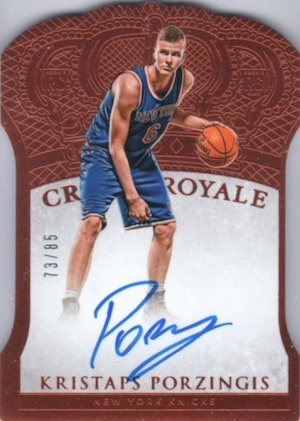 The chromium option for NBA collectors, 2015-16 Prizm NBA features a silver-heavy design and also includes multiple Prizm Refractor parallels of varying color. 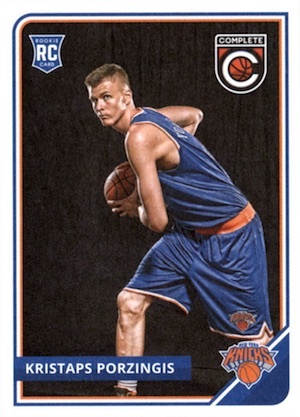 This will likely go down as one of the more popular low-end rookies for Porzingis. His on-card Rookie Signatures insert also enjoys good demand. While the actual brand release did not go over well, 2015-16 Replay also has original cards in addition to the hits from earlier sets. 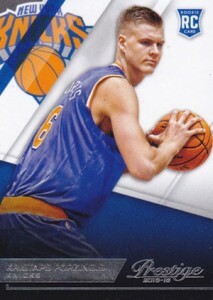 Among these are four different Kristaps Porzingis rookie cards, all numbered to 99. The only difference is the player image. 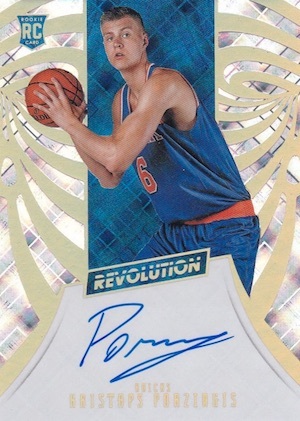 One of the louder designs in the group, 2015-16 Revolution only has one main rookie card for Porzingis but with several different background versions. There is also an on-card rookie autograph. 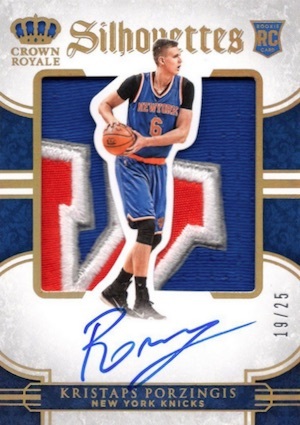 Fundamentally similar to Prizm, and even offering Prizm parallels, 2015-16 Select caters to the base collectors and autograph hunters for Porzingis. Beyond the three different base rookie cards, he has an RPA card with a sticker signature, and the on-card version shown below. 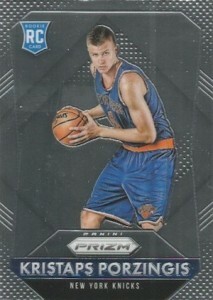 Admittedly, a lot of the Panini sets start to look the same, but 2015-16 Spectra is another Prizm-based release with a Kristaps Porzingis rookie card. Although the print run for the base auto relic is not known, there are a few low-numbered parallels. 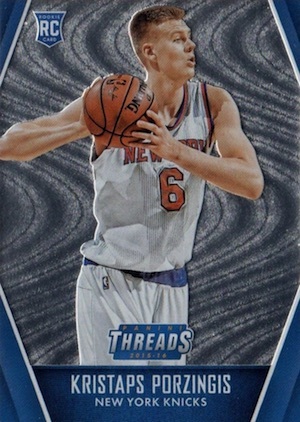 Exclusive to Target, 2015-16 Threads mixes designs and and styles to produce a quartet of rookies for Porzingis. Joining the base design are Leather, Wood and Micro-Etch cards. 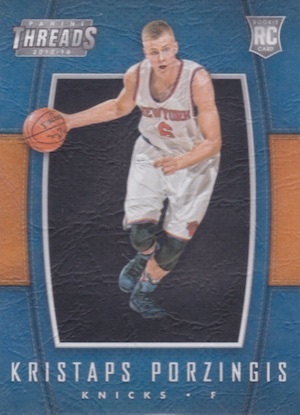 Like several of the Panini NBA releases, 2015-16 Totally Certified relies heavily on silver in the design. 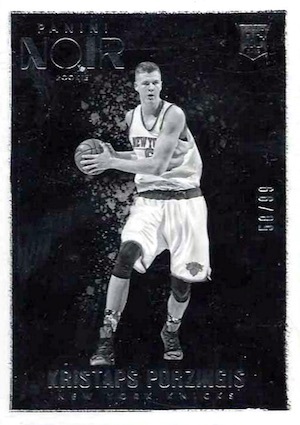 However, a non-traditional card layout and the many etched parallels help this Porzingis rookie card stand apart. Rookie Roll Call is the set to check out for signed options. He’s become a favorite very quickly. Not just for his play but the way he has handled himself, from the booing by the “fans” in Brooklyn to the hype around his rookie season. 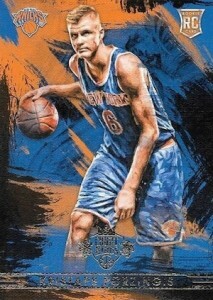 The Knicks are more fun to watch now than they have been in several years. I was thrilled when I pulled the Orange Wave Prizm of him from my first retail pack of Prizm. You are welcome to use my scan of the card if you want to. 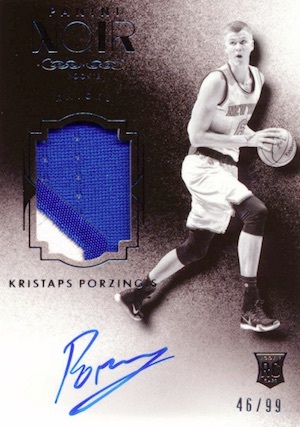 2017-18 Panini Noir Kristaps Porzingis Auto Patch #08 20 Mavs Knicks Reduced!